I see the date and am reminded of what happened 15 years ago…a tragedy we will never forget. 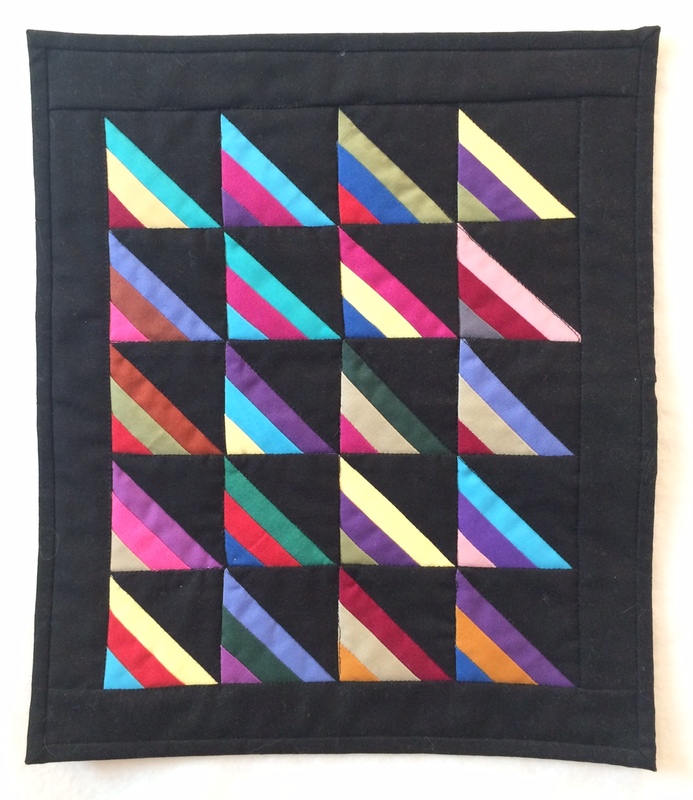 But today I want to write to you about a more simple and pure set of quilts made with solid colors. They are not crowded with adorable prints and they are often set with a black background color. These are a few Amish quilts from my doll quilt collection. The first one has beautifully vibrant red and purple 9 patches. 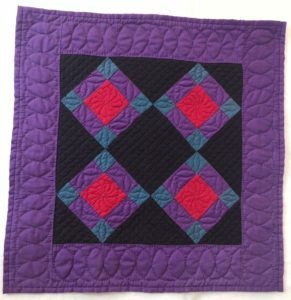 It only has four blocks but they are set off so nicely with the hand quilting which you can see in the close up below. 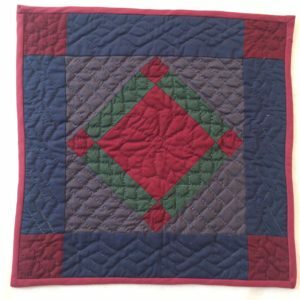 The next one is a charming little blue, gray and dark red quilt I picked up in Lancaster, PA when they had a quilt museum featuring the collection from Esprit. Unfortunately, the museum has since closed but their gift shop used to have beautiful quilts made by local Amish women. Can’t you just imagine watching this skilled woman with her needle and thread creating this treasure? I love the cable pattern in the border. 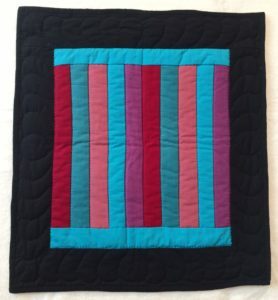 This next little quilt is made with bars and a black border. Simple but beautiful. The last one I wanted to share today is one that I made for myself. It has little stripes put together into triangles with black and is often called Roman Stripes. It seems the more contrasting and colorful the stripes are, the more interesting it becomes. 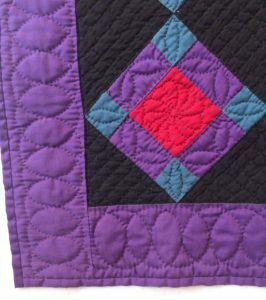 I hope I may have inspired you to try your hand at making a simple but beautiful little Amish quilt this month. Wooden Spools has stunning Cherrywood hand dyed solid fabrics that would work well for this. Stop in and take a look. “What I make with my Hands, I Give with my Heart”. ← R is for REPLAY… Replay “Q” that is!